Beat together the vegetable shortening or butter (see "tips," below), sugar, and vanilla until fluffy. Mix in the egg, then the flour. Scrape the bottom and sides of the bowl, then mix again, until thoroughly combined. Chill the dough for 30 minutes or longer, to make it less sticky and easier to work with. Near the end of the chilling period, preheat the oven to 375°F. Grease or line with parchment two baking sheets. Place 1/4 cup granulated or coarse white sparkling sugar in a bowl. Use a cookie scoop or a spoon to make 1" to 1 1/2" balls. Drop them into the sugar, then place the balls sugar side up onto the baking sheets, leaving about 2" between cookies; they’ll spread as they bake. Bake the cookies for 8 to 10 minutes, until the edges are lightly browned. The cookies will puff up and look soft, but they’ll fall and become crisp/crunchy as they cool. Remove the cookies from the oven. Let them rest on the pan for 5 minutes before transferring them to a rack to cool completely. Store well-wrapped cookies at room temperature for a week or so; freeze for longer storage. 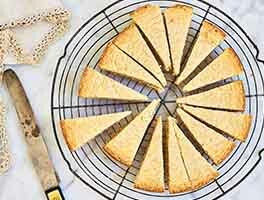 Don't have self-rising flour? 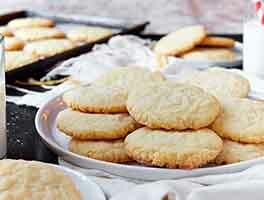 Try our recipe for Sugar Cookies using all-purpose flour. Which fat should you choose? 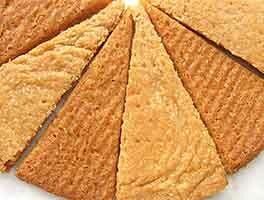 Use shortening for a puffier/thicker cookie whose texture is a bit hard, rather than crunchy; butter for a flatter cookie with a bit more flavor, and lighter/crunchier texture. I decided to make these cookies one day when I was bored and needed sugar ASAP! But, I'm not very keen on sharing. I cut the recipe in half (which was difficult with the 1 egg), added a pinch of salt, and a 1/2 tbsp of cinnamon to resemble snickerdoodles. These cookies are great! And, I very much recommend them to you. I had to go to several stores before I found the self-rising flour, but the search was well worth it. These are the best sugar cookies I've ever made. I used a large cookie scoop so the cookies are about 3 1/2 inches diameter. Also flattened them out a bit and then let them bake 12 minutes. They would be perfect for making ice cream sandwiches! Made one batch in the morning and later that day made a double batch. Needless to say, I love them! I'm not sure if I did something wrong but these did not flatten out as expected even after sitting. I double checked the ingredients and everything seemed fine... It also made only 30 cookies not 48 and were not that big. They tasted ok but not like some of the reviews here. Cookies were super crunchy and delicious, but were smaller than I expected. But who cares? This is definitely a recipe to be used over an over again.! excellent recipe very simple to follow, refrigerated dough for over 30 mins was easy to form. i used marg instead of butter because i wanted it to be milk-free. came out delicious! I made these with a little alteration, browned butter, 1/4 cup brown sugar, and vanilla butternut instead of standard butter, a whole cup of sugar, and vanilla. Holy cannoli they are the perfect. Like a cross between an ideal chocolate chip base and excellent sugar cookies, mostly crunchy with just the tinest bit of chewy in the middle. Not only did the entire family love these, I'm making some to gift as well. Hopefully the recipient will love them as well. First time baking these cookies. I felt like they turned out a little bland they're not very sweet. I'm going to try them again and see how they turn out, otherwise the recipe was very easy to follow. I think it's something that both myself and my family will enjoy baking together for the holidays. LOVE this recipe. Have made it before. Had difficulty in doubling it. Came out overly dry and the cookies were hard rocks. Not sure what I did wrong, but I don't recommend doubling this recipe if you don't have to. Otherwise BEST sugar cookies EVER! Easiest Sugar Cookies EVER! If you follow the directions as written, they will come out perfectly. My batch only made 2 dozen but they were the best 2 dozen EVER!